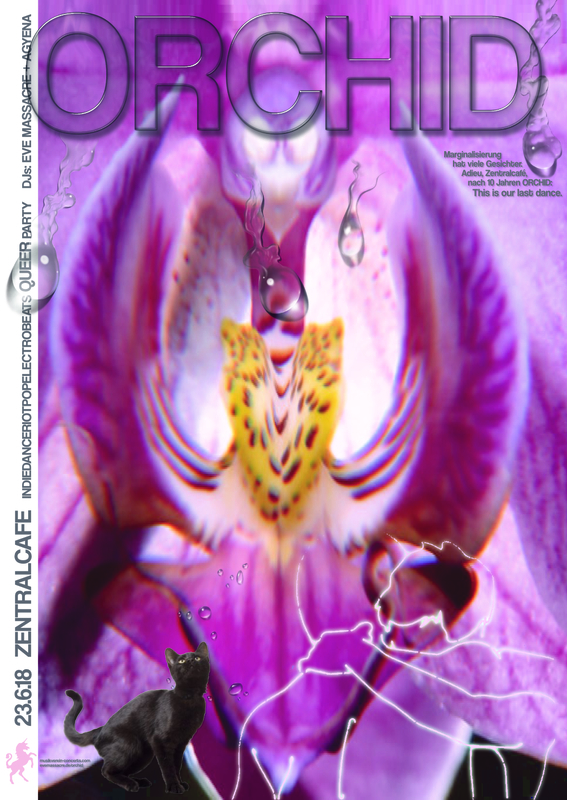 I have made you a poster for the last ORCHID at Zentralcafé. Being driven out, driven underground, out of the eyes of the casual visitor, has a bitter taste for a queer night that has celebrated loud and fabulous visibility of all kinds of queers in the very heart of this city for 10 years now. I am heartbroken to have to give up this room that is so much more than just a venue. It is a challenging, living and breathing social safe space for citizen culture. A space in which you can experiment, a place in which people have each other’s backs, help each other out to make ideas become real. 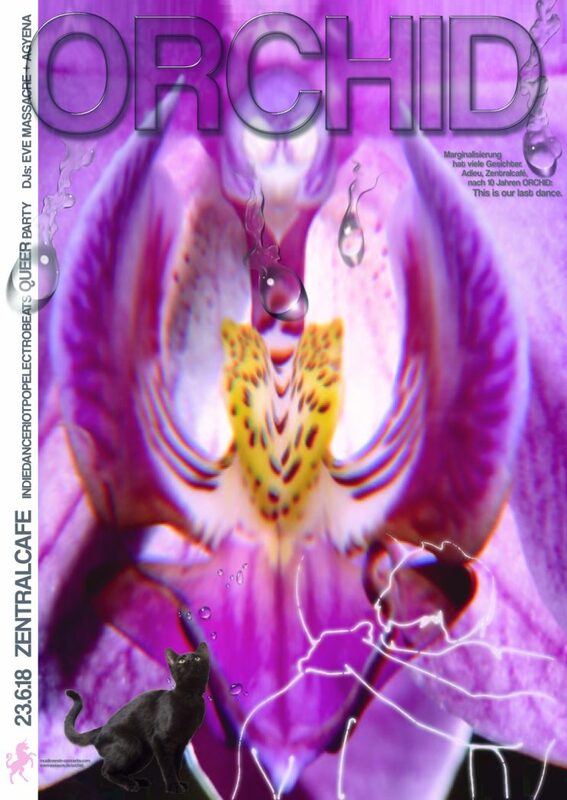 To push a collective that focusses on giving weird and critical, noisy and silly, wild and feminist, hard-rocking and tender-hearted, urban and marginalised pop culture a platform, like Musikverein im K4 does – ORCHID thanks you! -, well: To push this kind of culture out of the heart of K4 / Künstlerhaus two floors down under ground *is* nothing less but a cultural-political decision. It is a decision against our visibility and against low barrier access to our kind of culture. In this it is an act of marginalization that is not to be excused by technical pragmatism. It is a decision that I find especially hard to forgive in times when the conservative current and the noisy far right scum have grown louder once more and would love to make us disappear from public space, if not from the face of this planet. Nevertheless: We will party on, we will be seen and heard! Let’s make our goodbye to the Zentralcafé the loud and fabulous night this special place deserves! Glitter on, babes: This is our last dance.